Often considered the greatest Race Walker in history, Jefferson Perez of Ecuador was the favorite to win nearly every race he competed in throughout his illustrious and extensive career. The list of accolades throughout the incredible career of Jefferson Perez is nearly as long as the competitions he competed in. A specialist in the 20-kilometer Race-walking event, Perez has gold medals at nearly every type of international competition throughout the world. But Perez did not always know he would become a race-walker. He first tried race-walking in high school to complete a physical exam, quickly discovering he had a natural feel for the sport. At the young age of 14, Perez won his first gold medal in a major international competition, taking first place in the 5km Race-walk at the South American Youth Championships in his hometown of Cuenca, Ecuador. His first taste of success on the world stage would fuel an outstanding career filled with innumerable finishes atop the podium across the world. He qualified to his first Olympic Games at Barcelona 1992 at just 18-years old, but did not finish the 20km competition. Perez permanently graduated to the 20km distance in 1994, ineligible to continue competing as a junior in the 10km event. Consecutive victories in the South American Race Walking Cup in 1994 and 1995 set up Perez to compete with confidence at his first ever Pan American Games in Mar del Plata, Argentina in 1995. Ecuador’s race-walking star did not disappoint at the continent’s top sporting event, taking home the gold medal in the 20km event in a time of 1:22:53. Winning on the biggest stage of his career gave Perez the inspiration to aim even higher at the Atlanta 1996 Summer Olympics. When Perez entered his second Summer Games, Ecuador had never won a medal at the Olympics despite competing in each edition since the Mexico 1968 Summer Games. However, the weight of carrying the hopes and dreams of an entire nation did not slow him down. In fact, it made him even faster. With determination and incredible perseverance guided by his perfect race-walking gait, Perez stuck to his plan, gradually passing competitor after competitor until with just 3 kilometers left in the race, the sole of his shoe ripped. This did not stop him from passing his final two challengers, entering the Olympic stadium in the heart of Atlanta and crossing the finish line for not only Ecuador’s first Olympic gold medal in history, but also the country’s first Olympic medal, period. Perez’s shoe ripped in the middle of his Olympic race because they were the same that he wore to win the gold medal at the 1995 Pan Am Games in Mar del Plata. He vowed to build his mother a house after winning the Pan Am gold and spent all of his money to achieve this goal, leaving him unable to buy new shoes for the Atlanta 1996 Olympics. This incredible triumph will forever be remembered in Ecuador and in Atlanta, as 90,000 fans roared to life as he entered the stadium to cross the finish line. Jefferson Perez’s incredible story truly embodies the Pan American and Olympic values, and he will forever be remembered as a legend for this moment. But Perez was not done competing. After becoming the youngest-ever gold medalist in the 20km Race-walk at the Olympics, he would go on to become the first person to win three consecutive World Championships in 2003, 2005 and 2007. Perez set the World Record for the event at the Paris 2003 World Championships, which has only been beaten five times in the years since. Perez dominated at the Pan American Games throughout his career, winning two more gold medals in Santo Domingo 2003 and Rio de Janeiro 2007. Despite years and years of unprecedented success, Perez also shared moments of heartbreak, finishing in fourth place at both the Sydney 2000 and Athens 2004 Summer Olympics. But this would not deter him from coming back even stronger, finishing his career at the Beijing 2008 Olympics with a performance that will also live on in Ecuador forever. Perez raced once again with the hopes of a nation on his back, ending his career with a second place finish and a silver medal at the Olympics, Ecuador’s second in history, both of which belong to Perez. 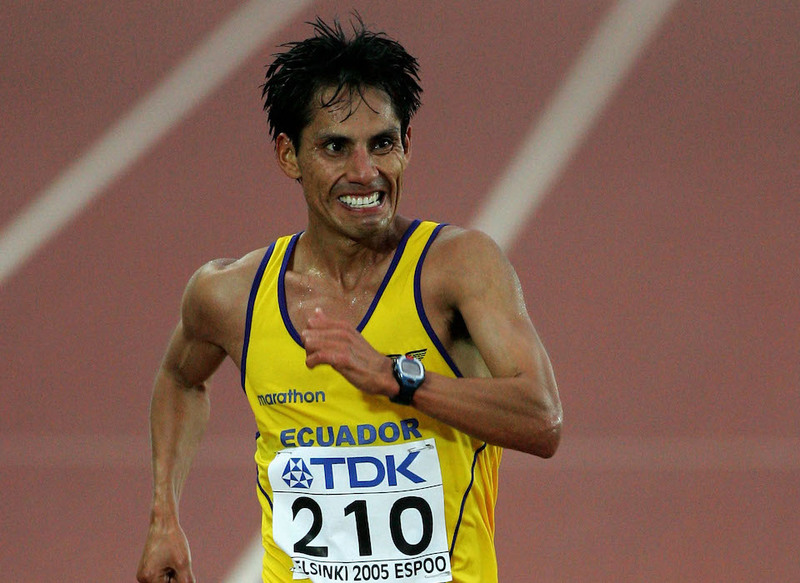 A three-time Pan American Games Champion and Ecuador’s only Olympic medalist in history, Jefferson Perez is a true Panam Sports Legend who competed with speed and grace throughout his nearly 20-year career. His name is etched in not only Ecuador’s history books, but also the history books of Athletics and the Olympics themselves.